Rice is a staple food in Malaysia. For my babies, I would like them to sample a variety of staple food and not just rice in their diet everyday. Growing home-grown rice is not realistic at the moment and one which I cannot commit while still struggling to complete my thesis, not easy since I can't really started my writing while trying to recover from post-natal and mental depression. I chose another relative of rice which is corn as the first tentative step to grow our own food. 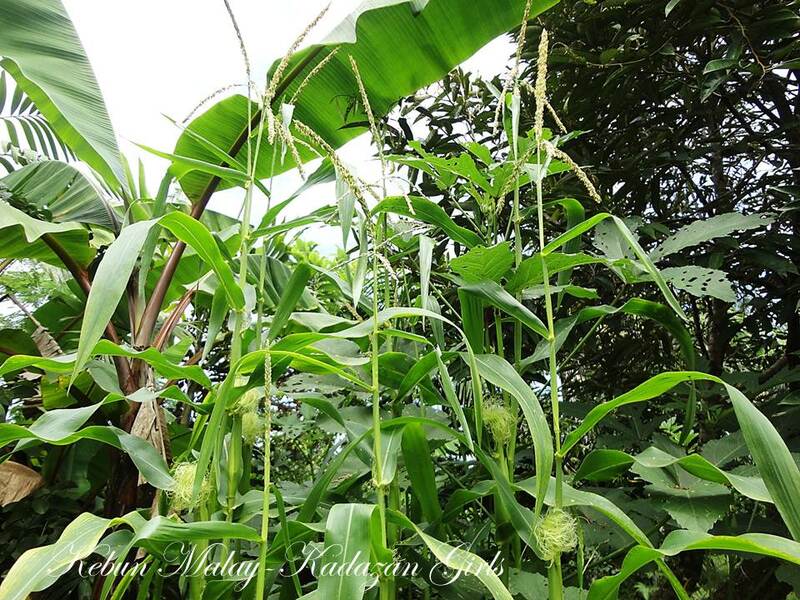 Thus this year, I decided to study the soil and weather at our place which is perfect for a successful growing corn requirement in different season and location. Perfect condition meaning I don't have to look after them as I need to be more committed and focus more on my thesis and my three babies which is all under 5 years old. All the plants including corns at the moment only depend on rain water unless we don't have any rain for 3 consecutive days. The first corn we decided to grow since we came back is Baby blue jade heirloom corn. Baby Blue Jade Corn is a very beautiful mini size corn compare to standard sweet corn size. Baby Blue Jade is about the size of baby corn just fatter and have fat kernels. 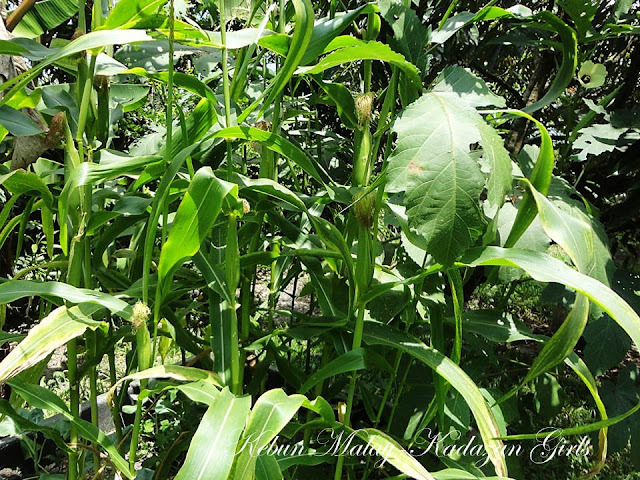 Therefore, baby blue jade corn is a blue heirloom open-pollinated corn that is suitable for gardeners that have limited spaces to grow their own food. 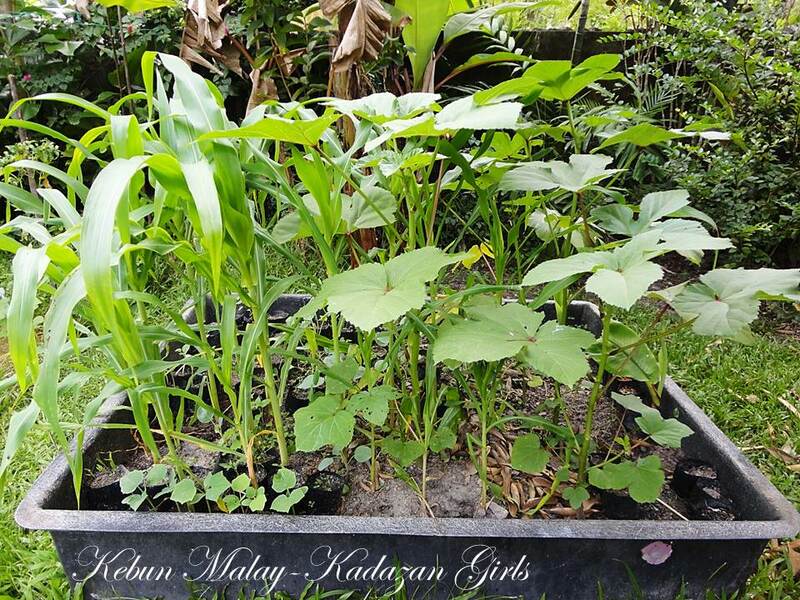 For fun, we did a trial growing baby blue jade corn on a meter square raised bed and just use a quarter of that space to grow Baby Blue Jade Corn next to okra plants which also dominated a quarter of space too. I also utilised the raised bed space for a place to sow seeds that will be transplanted later. One of the reason why I put small pots underneath the Baby Blue Jade Corn to prevent hens from scratching the soil and uprooted the young sweet corn plants. Happened several time, so this is one of the solution apart from fencing it. Although, many young Baby Blue Jade Corn were uprooted, the plants were hardy and strong enough to survive the attack after I replanted them back. Corn has very shallow roots which is actually not much a problem growing them in container. For successful pollination it is advise to grow many in block and not in rows. However, it does not mean to really grow them in perfect 'block', can be grown in circle or clumps as long as the plants are surrounded to ensure success pollination. This is one heirloom corn that balcony gardeners can try. can also be space much closer than the standard sweet corn size. The raise bed which we grew this first batch of Baby Blue Jade corn is situated underneath the canopy of Durian and Banana tree. I always observed on hot weeks from experience growing corns, the male pollen is not very rich and the male tassel somehow looks a bit worn out quickly, probably many got damaged before all the female hair came out. I am speculating that the banana leaves that shade the male tassel did make some contribution of corn success this time around. The male tassel did not seem to dry up fast. Tantalising silky female hair making an appearance. The male tassel still look good after lots of hair emerged from the ear. Almost the time to harvest waiting for the white hair to turn brown and drying. It is said the Baby Blue Jade Corn plant grows about 2~3 feets tall. But some of our plants were more than 5 feet tall. Surprisingly, Baby Blue Jade Corn is a good companion with okra plants. Can you see okra flower and fruit peeking? Baby Blue Jade Corn is an heirloom blue-coloured corn, but beginners at growing corns makes mistake easily with the ancient or heirloom coloured corn with the time of harvesting. 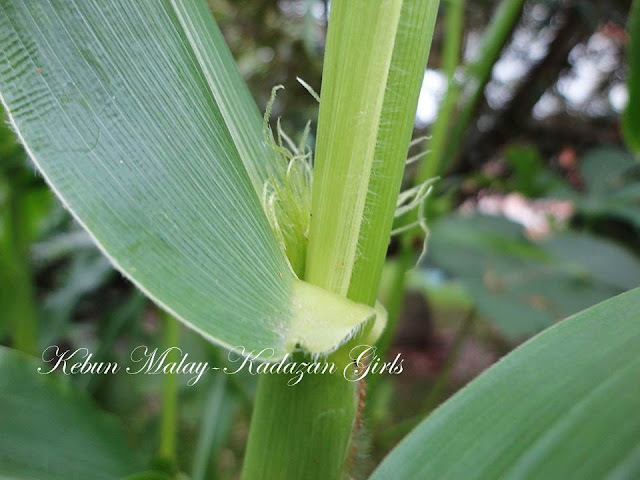 If you want to harvest the corn to eat them raw, grilled or boiled, harvest the corns before they turn blue and when you prick the kernels milky liquid ooze out. This is the perfect time to harvest them like the picture above. Eat while they are young. It is the sweetest corn, we ever tasted raw! We taught our boys to eat fresh home-grown corn raw since little. No need to hassle preparing boiling water at all. The corn also tasted better that way. Sowing corn to harvesting this stage took about 70~80 days. Corn is Ilhan favourite food while Rayyan is a carrot fan. I was very surprised that Rayyan finishes up one corn quickly than Ilhan and Rayyan is a very slow-eater. Little Rayyan was even asking for more and I even have to hide Ilhan share so Rayyan will stop pestering. 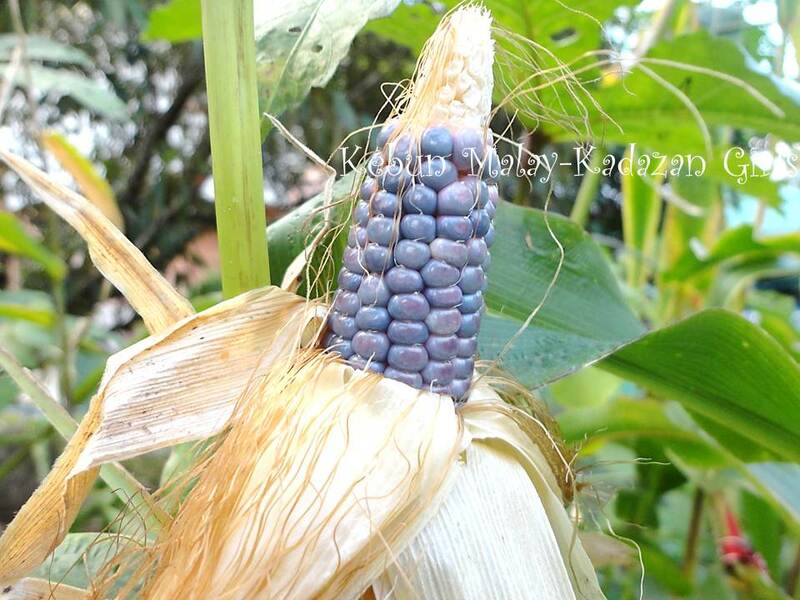 When the kernels turned blue, indicates that the corn is not palatable to be eaten just like that. However, the hard dried kernels can be use as popcorns or grind them for your very own home-grown corn flour. Also look very pretty as ornamental hanging in the kitchen, I am just happy looking at them in our kitchen drying. One of my passion in gardening is collecting heirloom seeds. Although, it was hard to resist not to harvest all of them young, I managed to harvest some just enough for my private seed bank. Hopefully with the seeds that I collected can help us to grow more for our babies. Collecting seeds requires patience and hopefully with the next new batch with our own home-grown collected seeds will be able to grow more and collect more seeds. Lets share stories at Liz Suburbun Tomato Saturday Spotlight. So does it produce blue popcorn? I like that the color can tell you when to eat it. I've always had trouble about when to pick corn. I've gotten better though. That is so beautiful. 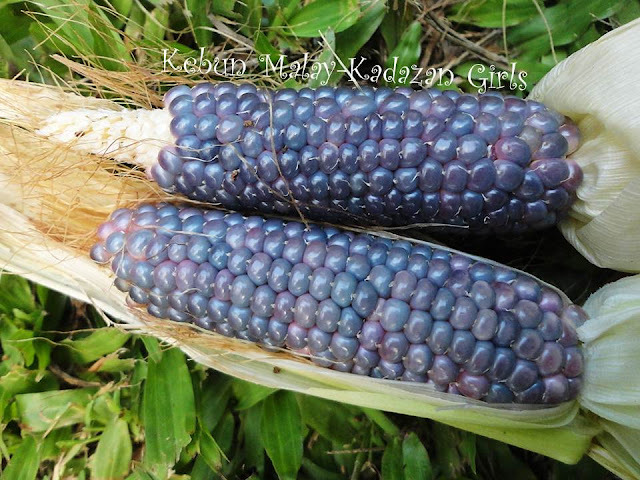 I saw a multicolored corn in another blog and thought it was just too pretty to eat! It does look beautiful. I am in awe that you can manage blue corn and a blog with very young children and a thesis and suffering from post natal depression! I also won't to know if it'll make blue pop corn. Oh that looks lovely - and I am sure it would grow here if it grows in Malaysia, but I cant seem to find the seed available in Australia. I know they make blue corn chips in America,and it must be from this corn. wahhh... bestnya dpt tanam jagung sendiri... belum pernah nampak spesis jagung ni... rindu banget dgn kenangan silam kakak dulu.. dulu pun late father pernah tanam jagung.. utk komersial.. berjualan di pasar tani.. mmg puas mkn jagung rebus..
Kalau ada benih ni kak mar nak juga ya..
wah mana kak diana cari benih dia? haritu time maha expo pon purple corn seed dah habis dulu.. best jugak nnt saya suruh adik saya tanam, hibrimas yg kitrg tanam tu pon manis.. Very impressive! I think it is too decorative to eat. I'd want to have it on display. Felicitaciones!, es un maíz realmente bello. Espero obtener esta variedad en mi nuevo cultivo. What a lovely harvest from someone who is multi-tasking! The corns are full of kernels. I had these corns some time back and it was simply too pretty to be eaten, so I had them dried and use as a decoraive piece in my kitchen. These stupid anonymous hackers are indeed becoming a problem all over. Why have they suddenly decide to pester blog-owners? Anyway, you are so industrious. You are writing thesis, and then working in your garden and looking after three little kids. What's your secret? Your thesis is on which field, if I may ask. Wow, you even have a durian tree!!!!! That is a lovely corn, and one I've never heard of. Thank you for sharing information about it! Sue~ I am saving the seeds with this batch. We sowed many fresh seeds this month and germination looks like 100%. Hope with the next harvest will see what colour popcorn will it produce. Daphne~Same here. 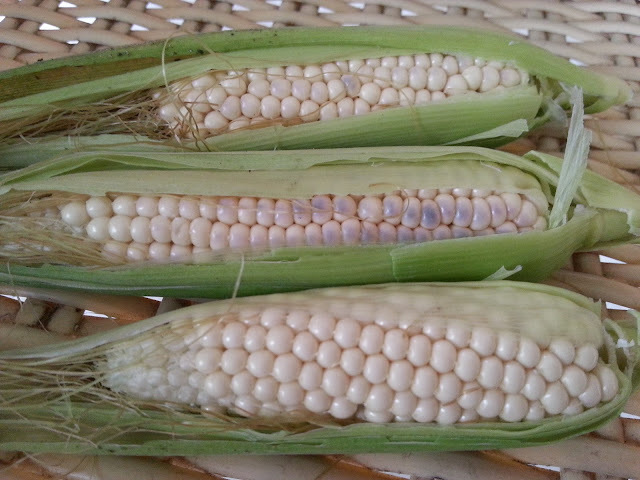 I always tend to get too excited and pricking the kernels early only showed us watery liquid instead milky. Charmcitybalconygarden~ I hope next month, I will be able to sow some multicolored corns. Bet they look very ornamental. Veggiegobbler~ Only one thing is hard to manage is writing my thesis nearly impossible. Got distracted easily. Africanaussie~ Yes, I am sure it will grow much better in Queensland. Kak MaDiHaA~ Jagung ni bila tanam banyak kekadang tak termakan kan. Bila dah banyak saya potong simpan butir isinya dalam freezer. Boleh pakai bila nak masak cepat macam nasi goreng. Ya, nak kena tanam serumpun. Kak Mar~ InsyaAllah adalah minggu depan biji benihnya. Kesuma Angsana~ Yang ni antara jenis species biru , tapi size comel macam babycorn sahaja sesuai untuk kanak-kanak. Helentea~ Oh yang ni dari kawan seedsaver group. Dekat MAHA ada jual corn seeds purple hybrid hari tu masa pergi ada banyak lagi dekat stall yang berdekatan kebun jagung dan sunflower. Mark~ Looks very good in the kitchen hanging as decoration. Always made me smile. Stiletto~I am happy I pick a good location for the corns to grow well. Dani~ I got very excited looking at a different corn. KL~ No secret. I am still struggling to find time to write my thesis. But at the end of the day, too exhausted even to write anything.My thesis evolved around genetics. 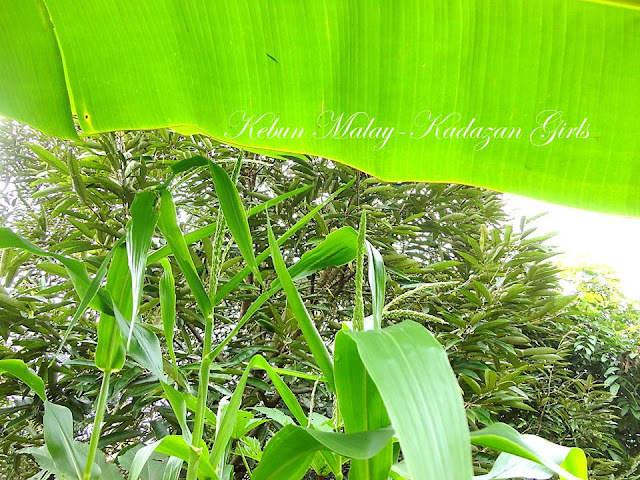 Rainfield61~ Ada pokok durian. Tapi belum bagi buah nak makan. Lrong~ This one is shorter than the standard corn size. Dave~ You are welcome :). Kirsty~ My veggie patch are covered with weeds actually. Don't have much time for weeding these days.